Esther Geizhals was born in Lodz Poland in 1929. At the age of 10, she and her family were moved to the Lodz ghetto where they lived under terrible conditions until 1944. 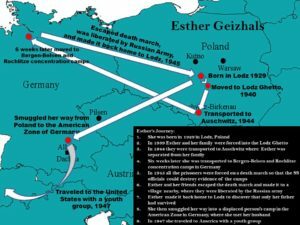 At that time Mrs. Geizhals was transported to Auschwitz extermination camp. Six weeks later she was moved again to Bergen Belsen and on to Rochlitze concentration camp in Czechoslovakia. In 1945, as the allies were advancing, the whole camp was made to walk for days without food or drink and just a few hours of sleep on fields. Many died and later this was known as the death march. Mrs. Geizhals and four other people escaped during the death march and worked their way to the next village where they were liberated by the Russian army. Eventually she managed to get back to her hometown of Lodz in the hope of finding any survivors of her family. She was very fortunate to find her father who was the only survivor of her family and relatives. Mrs. Geizhals smuggled her way from Poland to the American zone in Germany, where she lived in a displaced persons camp until 1947 at which time she came to the United States with a youth group. 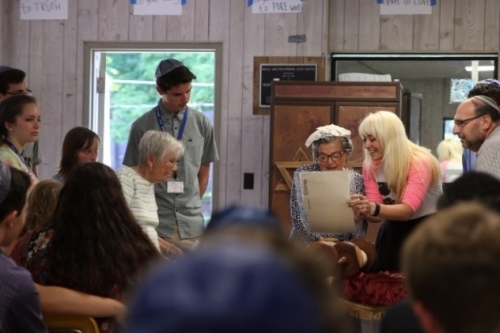 Esther Geizhals, of Larchmont, (center) speaks to BBYO student leaders at the Perlman Camp, Lake Como, PA.
Esther Geizhals, of Larchmont, (center) is interviewed by students from the New York Medical College (NYMC). LARCHMONT, N.Y. -- Esther Geizhals of Larchmont celebrated her bat mitzvah at the BBYO International Kallah in Lake Como, Pa. this past weekend. 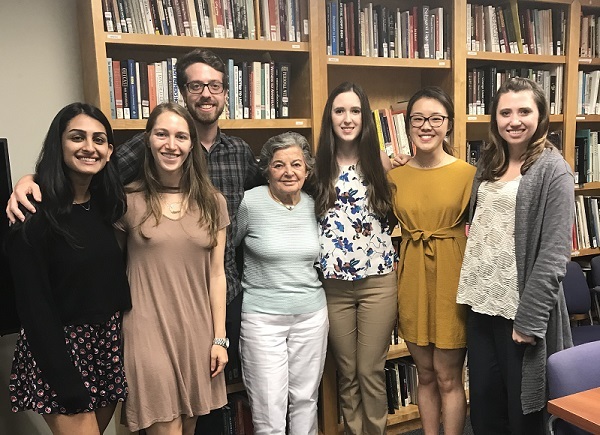 Geizhals was part of a group of Holocaust survivors representing the Holocaust & Human Rights Education Center, who spoke about their experiences growing up under Nazi occupation before 225 teens from ten countries. Geizhals, whose family was forced into the Lodz ghetto when she was 10 years old, survived the Auschwitz extermination camp, and the concentration camps at Bergen Belsen and Rochlitze, never had the opportunity before to have a bat mitzvah.